A few weeks back, I was sitting with some students from a really tough part of our city and working through some of their resources. Part of our groups involve identifying and building up the student’s sense of courage, connectedness, self worth, and capability. What we noticed with this group is a general lack of self-reported capability. This seemed to be the trend throughout the group of young men. This was a strange happening in my experience. Generally, a group of young men will tend to overstate their courage and capability from a place of machismo or even lack of self-esteem. It’s a coping mechanism everyone uses from time to time to protect us from being real with each other. Yet for some reason, these young men decided to stop with the charade. Several of these young men were facing criminal charges as adolescents and were in a general “holding pattern” as they awaited what their PO (parole officer) or presiding judge had to say about their case. They felt like they had no real recourse and that the mistakes they made would follow them for the rest of their lives. These young men were between the ages of 15 and 17, and at this early age, they were experiencing something reserved for people typically much older – hopelessness. This hopelessness echoes from their upbringing, family structure, and their neighborhood. It’s a general sense that no matter what happens, they are doomed to the same cycle they have seen over and over again. My guess is this hopelessness has been ingrained earlier than my arrival into their lives. So today, I am wondering as a “helper” of students, what can I do to bring hope to those whose hope has escaped at an age where hope should abound? I have a few things I have been thinking through along these lines, but I’d like to hear more feedback from you! Help students see their “preferred future” – This is technique based in solution focused therapy, but it is a really great tool to help the hopeless imagine what their life would be like if things were different. I typically ask students the simple question, “What do you want?” I usually don’t have to be a lot more specific than that. And with that question comes glimmers of hope. You see, even in the darkest night of the soul, the soul still knows what it wants. Help them work backwards from their “preferred future” – When they establish the goal, help them identify simple, realistic, and controllable steps to start walking in that direction. I wouldn’t even focus on what it would take to accomplish the desire. Really, this is likely too much to handle in the moment. Instead, what would it take to at least turn in the right direction and even take a small step? Maybe it is simply getting more sleep, finding a new job, or asking for help. Try to stay with the small and manageable tasks. Help them to think about how things will be different when they get to their “preferred future” – In other words, will this make much of a difference? Often the solutions we want won’t really fix anything, but sometimes they do. Helping students think about what things need to be different for their futures to look more positive are very simple. Sometimes life isn’t as horrible as we think it is in our worst moments. One of the most unacceptable circumstances for me to witness is a hopeless student. I’m not okay with it. None of us should be. 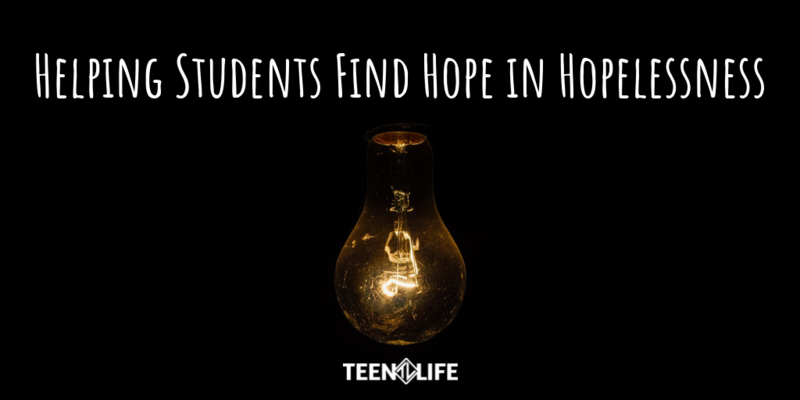 So with the three simple ideas I posed here, what would you add to help students find hope in hopeless situations? We would love to hear back from you!